Home › Fundraising › Pamper for Piping – A Successful Night!! 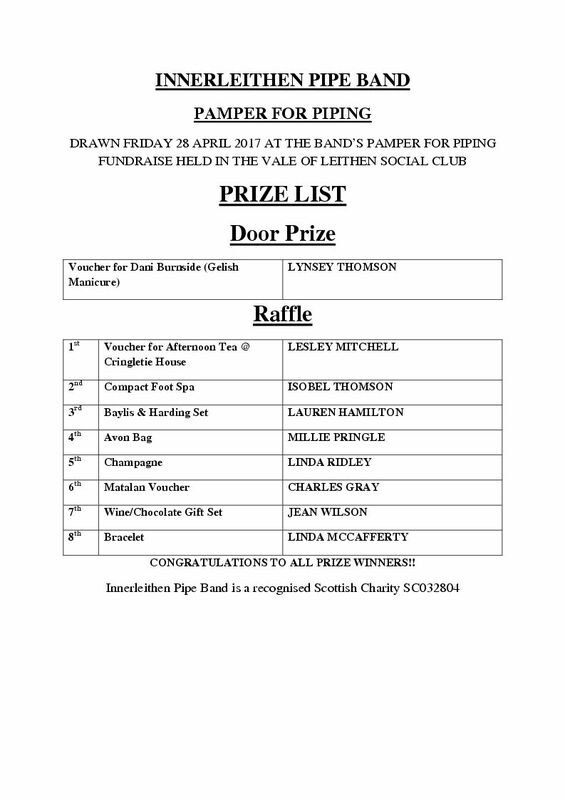 On Friday 28 April, the ladies of the Band ran the first ever Pamper for Piping in the Vale Club Innerleithen. The Band raised £450.00 for its funds, a tremendous amount for a first time fundraiser! A success of this magnitude is down to the hard work of many people both before and on the day. The Band would like to acknowledge and thank Rosemary Gordon and her team of Dorothy Gray, Lynsey Thomson and Linda Ridley for their efforts in organising the event. The Band would also like to thanks the Pamperers who provided treatments and talks during the evening – on hair Pauline Cox and Gillian Rendle; on nails Donna Caven, Lilias Cummings and Rachel Hale of RH Nails; on hand waxing Nicky Raton, and on posture Lesley Mitchell. We would also like to thank the Vale Club for the use of the club premises on the evening.